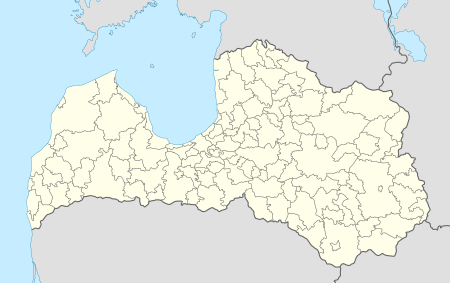 Alūksne (German: Marienburg ) is a town on the shores of Lake Alūksne in northeastern Latvia near the borders with Estonia and Russia. It is the seat of Alūksne municipality. Alūksne is the highest elevated Latvian city, located in East Vidzeme Upland at 217 m above sea level. The high elevation of the city affects the social and physical arrangement of the place. The region around Lake Alūksne was originally settled by Finnic-speaking tribes, and from the 8th-12th centuries by Latgalians. The date of settlement at the current location of the town, then known as Olysta, Alyst, and Volyst, is given in the chronicles of Pskov as 1284. The later name "Alūksne" comes from the Latgalian word olūksna, meaning a spring in the forest. The Latgalian inhabitants of the settlement were conquered by the German crusaders of the Livonian Order in 1342 . They built a castle named Marienburg (after Mary, the mother of Jesus) on a nearby island, which served to protect trade routes from Riga to Pskov. The town which developed near the castle also became known as Marienburg. Marienburg was captured by the troops of Ivan IV of Russia in 1560 during the Livonian War. It was incorporated into the Polish-Lithuanian Commonwealth in 1582. The town became part of the Swedish Empire in 1629. Ernst Glück, a Lutheran clergyman and the first translator of the Bible into Latvian, founded the first Latvian language schools in Vidzeme in 1683. It is now the Alūksne Museum. The Russian army led by Sheremetyev captured the town during the Great Northern War in 1702, doing great damage to the area and deporting all the inhabitants, including Glück and his foster daughter, Marta Skavronska, who later became Empress Catherine I of Russia. After 1721 Alūksne became part of the Livonia Governorate but for many decades it was a devastated and minor settlement. Alūksne started development in the 19th century when it became a major trading centre. Further development was stimulated with opening of narrow gauge railway line Stukmaņi-Gulbene-Alūksne-Valka in 1903. During Latvian War of Independence Alūksne was one of the first major settlements in Vidzeme which was liberated by Latvian Army in May 1919. In 1920 Alūksne was granted town rights. Since 2009 it is an administrative center of the Alūksne municipality. The town's island is known as Pils salas (Castle Island) and Maria Island. Alūksne Castle is now used as an open air theater. Wikivoyage has a travel guide for Alūksne. Wikimedia Commons has media related to Alūksne. ↑ "Latvijas augstāko pilsētu TOP 20". neogeo.lv. 2010-05-24. Retrieved 2014-12-18. ↑ "International Relations". joniskis.lt. Retrieved 29 April 2014.